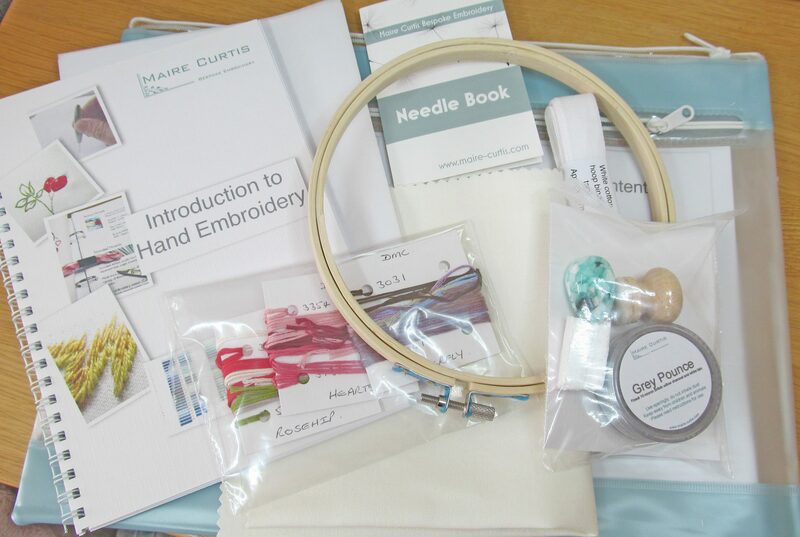 Maire Curtis Bespoke Embroidery courses are now available via distance learning. It is not always convenient to attend workshops on a given date and some people prefer to study at their own pace. With this in mind, we are developing our courses to allow distance learning at a very reasonable cost. Our first two courses: Introduction to Embroidery and Essential Goldwork are now available for booking through our secure online store. Introduction to Embroidery Distance learning pack. All materials you need to complete the course are provided, along with our spiral bound, lay flat course booklet in a handy zipped wallet to keep your work clean. Students will have access to expert tuition by Maire Curtis via e.mail for a whole year after enrolling and there is a dedicated Facebook page for students to swap ideas, progress or simply talk to each other. Learn professional embroidery skills in the comfort of your own home. On completion of the course and submission of images of the finished project, students will be awarded a certificate of achievement.